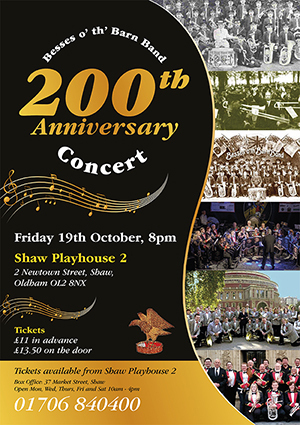 Join us to celebrate our 200 year anniversary with a Celebration Concert at Bury Parish Church on Saturday 27th October at 7pm. 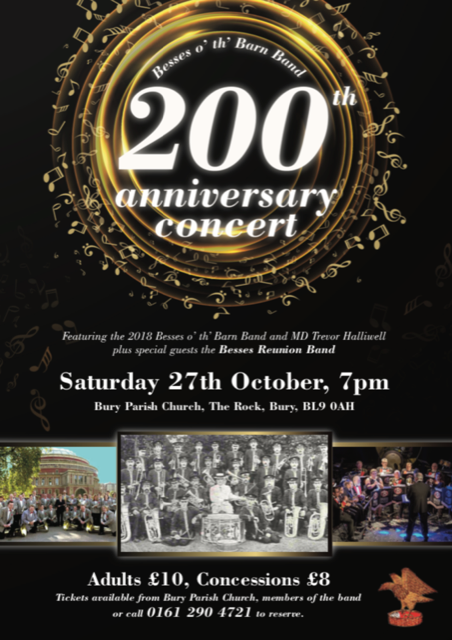 The concert will feature the current Besses o' th' Barn Band alongside special guest players from the band's illustrious past forming the Besses Reunion Band. Tickets are £10 for adults and £8 concessions, and are available from Bury Parish Church. members of the band or can be reserved for collection on the door by calling 0161 290 4721. After much hard work by members of the band past and present we're delighted to be back in the Besses bandroom on Moss Lane. There's still plenty of jobs to keep us busy including recataloging the extensive library, but it's great to be back. A special thanks to our Chairman Barrie Chappell and solo horn player Nick Guzman for the many many hours they've put in! We are looking to fill the last few empty seats in the band. Rehearsals are every Tuesday and Thursday 8-10pm.